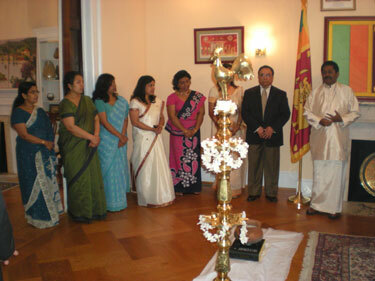 Ambassador Jaliya Wickramasuriya hosted a diplomatic reception at his residence April 22 to celebrate the Sinhala-Tamil New Year. The event featured traditional Sri Lankan food, the lighting of an oil lamp and a presentation by Sarindee Wickramasuriya explaining the customs of the Sri Lankan New Year. 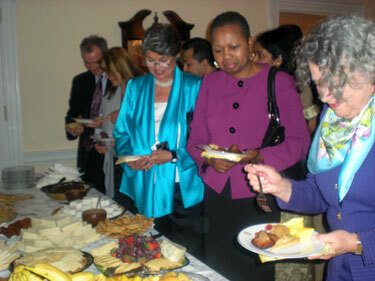 Guests enjoy traditional food as part of the New Year celebration 2010 at the Washington, D.C., Sri Lanka residence. 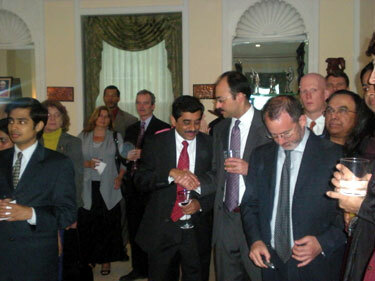 Guests included diplomats and U.S. Government Officials, business people involved in Sri Lanka and scholars. 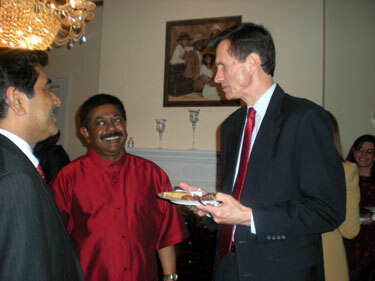 Officials of the U.S. administration and other guests take part in the Sinhala-Tamil New Year celebrations held at the Sri Lanka Ambassador’s residence in Washington DC. “In Sri Lanka, this holiday allows people to forgive and forget the past, and to look forward,” Ambassador Wickramasuriya told his guests. “We put our differences behind us and pledge to one another to live peacefully together in the future. Jaliya Wickramasuriya, Sri Lanka’s Ambassador to the United States (right), Deputy Chief of Mission Tissa Wijeratne (second from right) and Embassy Staff celebrate the Sinhala-Tamil New Year at the Sri Lanka Embassy in Washington. Previously, the staff of the Embassy of Sri Lanka in Washington, D.C., held a Sinhala-Tamil New Year celebration at the Embassy on April 14. Additionally, Ambassador Wickramasuriya and Embassy staff took part in an April 17 New Year celebration hosted by the Sri Lanka Association in Washington, D.C. Yet another New Year celebration was held by the Venerable Katugastota Uparathana Nayake Thero at the Buddhist temple in Wheaton, Maryland.